This leafy green dream, known as “The Tunnel of Love,” doesn’t get its stunning shape from a team of highly-skilled arborists but rather, from the comings and goings of a particular freight train. 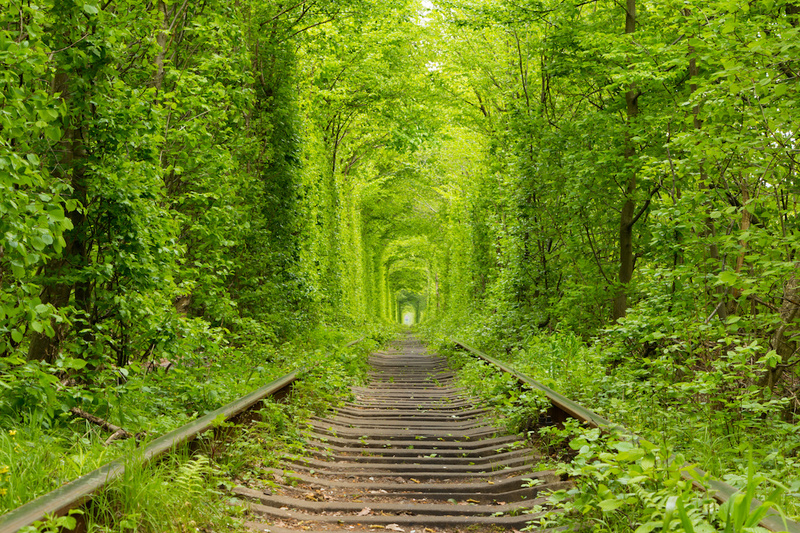 Located in western Ukraine, the Tunnel of Love is an exceptionally beautiful tree-lined railroad that attracts people from all over the world with its artfully arched branches. Approximately three kilometers long (about two miles), this private railway transports lumber from a nearby factory, making three trips daily, seven days a week. And it’s the back and forth of the train that has created this dream-like scene, one that looks more like a fairy tale than a working rail line. With just the right amount of leaves and light, the Tunnel of Love –– more magical forest than transportation corridor –– simply mesmerizes. Just remember to look both ways before crossing the track.